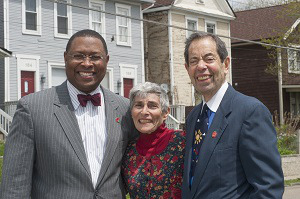 Dr. James L. Moore III, vice provost for diversity and inclusion and CDO at The Ohio State University (OSU) and couple Missy and Bob Weiler have come together to establish the Dr. James L. Moore III Scholars Program to support undergrads transferring from Columbus State Community College to OSU. Dr. James L Moore III with Missy and Bob Weiler. The Weilers have lived in Ohio since 1957, working at elementary schools and serving on education boards, and are passionate supporters of lifelong education, according to OSU News. The Weilers recently donated more than $800,000 to support the Dr. James L. Moore III Scholars Program. Moore and his team will choose ten students to benefit from the scholarship annually. “Our motivation has been and continues to be, regardless of your background and where you come from, how do we create a situation where optimal success can occur?” Bob Weiler said. To read more about their story, please click here.